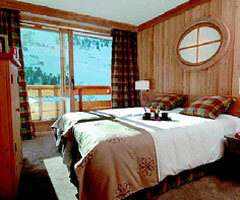 Chalet Charlie is situated in a absolutely superb position in the centre of resort with instant access to skiing. Distance to Lifts is 50 yards walk La Croisette ski lifts. Distance to Nearest Ski Point is 50 yards easy walk. Right in the centre of resort. Charlie is is a lovely ground floor apartment which has undergone significant improvements in recent years and as a result it provides really comfortable space throughout. There is a large and light open-plan living/dining room which leads to a lovely sunny balcony, ideal for watching the evening sun go down over a sumptuous afternoon tea. All bedrooms are well laid out (one small twin) and the modern bathrooms provide great facilities for all. Situated in an absolutely superb position in the centre of Courchevel 1850, it is just behind The Forum which houses many shops, bars and restaurants. La Croisette with its 3 main bubble lifts accessing the full Three Valleys is an extremely straight-forward short walk away. You can ski back at the end of the day within yards of the building's front door via a popular blue run and the ski school meeting point is close by. Over recent years, Courchevel 1850 has become renowned for its glitz and glamour and the many bars, restaurants and shops it has to offer are all within striking distance of The Charlie, therefore we're certain this great property provides a superb option for mid-size groups or families of up to 8 people. The Charlie is run by one of our friendly chalet hosts who lives out but nearby. Additional: 2 bathrooms (no loo). 1 shower room with loo. Separate loo. La Croissette lifts 50 yards walk. Closest skiing point 50 yards walk.